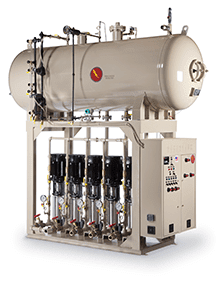 A steam boiler is only as reliable as the feedwater system supplied with it. 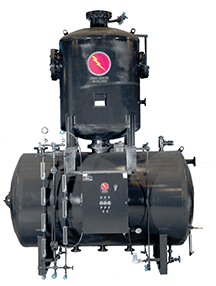 Precision is one of a select few manufacturers you can trust to supply a total steam generating package—not just the right steam boiler or generator. We design and fabricate a broad range of feedwater collection and pumping systems, including ASME code deaerators as well as non-code condensate storage tanks. 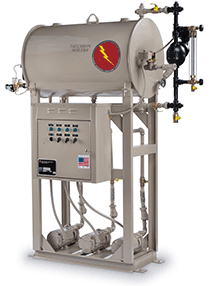 Precision’s engineers and sales representatives will work together to recommend the feedwater package that best fits the application’s steam demand profile and minimizes the volume of both make-up water consumed and the quantity of feedwater chemistry used. Precision will propose a total package solution that increases the system’s reliability, extends its life, and minimizes both maintenance and operating costs over time. 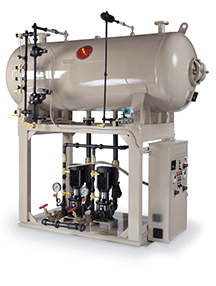 In addition to deaerators (SP/spray and TR/tray) and condensate receivers (CF) with feedwater pump packages, we also offer chemical feed packages and water softeners to create a truly complete steam boiler room solution. Non-code condensate receiver tanks are recommended when there is a high rate of condensate return and minimal make-up water is required. Our CF systems are designed to receive condensate and prepare it for return to the boiler. They can also be paired with a DA to accommodate condensate surges that would otherwise be lost through the DA’s overflow drain. Precision CF systems are custom designed to include the appropriate pump and control packages that best fit the application requirements. Standard water level control is a float activated make-up water valve that adds fresh water to replace condensate lost through the steam loop or to the process; the float assembly is installed inside tank (standard) or can be externally mounted and piped to sight-glass water column. Deaerators (DAs) are recommended when the steam system requires significant volumes of make-up water that must be treated to remove free oxygen and carbon dioxide from boiler feedwater. Precision’s Tray-Type DA is the best choice for large stream flows where limited condensate return creates a large demand for makeup water. The Tray Type DA relies on internal spray valves, a cascading series of trays, a vent condenser, and fresh steam to create conditions for large flows of make-up water to release the O2 and CO2 naturally. Investing in a Tray-DA reduces dramatically the consumption of costly oxygen scavenging chemicals otherwise required to prevent corrosion leading to premature steam system failure.